For embedding(to embed a video or audio in your page), you need to use the <code></code> tags in the html editor (not the visual) to make it work. The embed method has the advantage that it can be added in any type of website without having to install a plugin and it covers a wide range of formats and audio and many video channels provide the code for you. With embedding you can play MP3, WAV, AIFF, JPG, PNG, MOV and GIF. Not all browsers support MOV, WAV or AIFF, though. Here is an example of embedding in WordPress. It is simply copied and pasted from a YouTube video. Width is simply the width of the video in pixels, same with height. A pixel is one light-dot on your computer screen. so, width=”425″ means, make this video 425 light-dots wide. That’s it, no magic tricks needed. where http://www.brightcove.tv/title.jsp?title=1386343200 is the link to a Brightcove video. Thus, if you fill in your own video in this wayhttp://www.mydomain.com/myvideos/greatvideo.mov then it will work like a charm and it doesn’t matter if you type this in the visual- or html editor mode. The player supports FLV, MOV, MP4, MP3, M4a, WAV, AIFF, AAC, JPG, PNG, MOV, and GIF. I use this method in the Art videos category. The player recognizes a wide variety of media, so if you have an audio, the player will handle it correctly. Not all Video network services support this player . For example, Vimeo videos cannot be imported this way, therefore you need to resort to embedding again in that case. 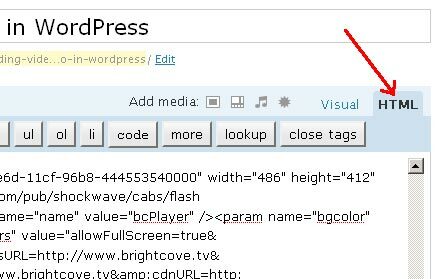 However, services like Vimeo, Myspace, etc,… provide their own embedding code to copy and paste into your site.